Nothin But Net Video Slot Guide & Review - Casino Answers! Bets on the Nothin’ But Net slot machine are $0.10, $0.25, $1, $2 and $5 per line. You can select from 1-9 paylines. You can bet anywhere from ten cents on the Nothin’ But Net dime slot machine up to the maximum total bet of $45 per spin. Nothin’ But Net has a decent betting range that most casual players and high rollers will be able to enjoy. You can play 1-99 autoplay spins using the autoplay feature. You can play all 9 lines on the Nothin’ But Net slot game by pressing the “Bet Max” button. You can also spin the reels on Nothing But Net by selecting your bet and pressing the “Spin” button. The Black Jerseyed Player is the highest paying symbol on the Nothin’ But Net online slot game, paying up to 3000 coins if 5 symbols land on a payline. The second top jackpot on Nothin’ But Net is the Blue Jerseyed Player, which will pay up to 1000 coins for 5 symbols on an active payline. The scatter symbol on Nothin’ But Net is the Scattered Scoreboard symbol. 2, 3, 4 or 5 Scattered Scoreboard symbols anywhere on the reels of Nothin’ But Net will pay out 1X, 5X, 20X or 200X your total bet. The Logo symbol is the wild symbol on Nothin’ But Net. It only appears on reels 1 and 5 and will substitute for all symbols except for scatter symbols. The prize is doubled when one or more Logo symbols substitute in a winning combination. When the Logo appears on reels 1 and 5 at the same time, you will win 15 free spins with a 3X multiplier. The free spins feature can be re-triggered. Free spins are played at the lines and bet of the triggering game. Free spin wins are added to payline and scatter wins. Score big on the Nothin’ But Net slot game when you trigger its free spins feature at [Americans: Unfortunately due to legal restrictions you are unable to play at any of the online casinos this game is at. We recommend you trying playing the unique slots at Win A Day Casino instead.]! Highest win only on each selected payline. Coinciding wins on different selected paylines are added. Payouts are made according to the Paytable. Payline wins are multiplied by the bet per line. All symbols pay left to right only in consecutive order, except for the Scattered Scoreboard (which pays any). Scatter wins are multiplied by the total bet. 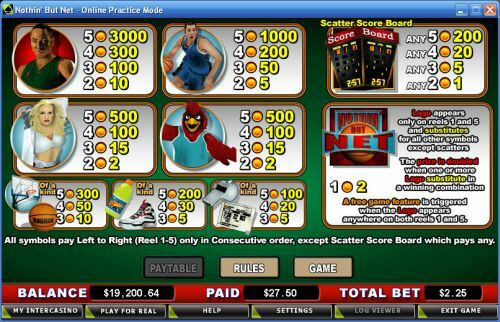 Scatter wins are added to payline wins. Scatter wins are paid independent of paylines selected. Nothin’ But Net is a video slot with nothing much to offer other than to sports fans. If you enjoy a good game of b-ball, you can play the Nothin’ But Net slot machine for real money when you sign up and make a deposit at [Americans: Unfortunately due to legal restrictions you are unable to play at any of the online casinos this game is at. We recommend you trying playing the unique slots at Win A Day Casino instead.]. Can players from the United States play Nothin’ But Net for real money? No, American players cannot play the Nothin’ But Net online slot game for real money at this time. However, there are a couple of USA-friendly basketball slots you can play at Bovada. Where can I play more basketball and sports slot games? For a full list of sports-themed slot machines, including basketball, baseball, football, hockey, auto racing, horse racing, golf and more, please read our list of sports-themed slots.